Someone who claims to be in possession of a Galaxy S4 prototype decided it would be fun to benchmark it, giving us a look at how the phone might, possibly, perform and what might be inside Samsung's next Android flagship. 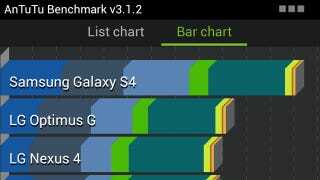 The Antutu benchmark test reports that the S4 is powered by Samsung's own Exynos 5410 chipset, with its eight cores running at 1.8GHz clock speed. It's coupled with a PowerVR SGX 544 graphics processor, with 2GB of RAM onboard. The S4 in this allegedly current state also feature a 4.99″ display running at 1920×1080 resolution, with Android 4.2 the phone's launch OS. The tested machine featured GSM and LTE radio capability, meaning one version of the device ought to launch worldwide. And there's a 13-Megapixel camera in it.